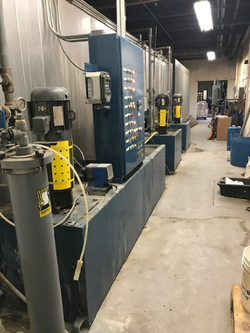 Slocum Equipment, Inc. has over two decades of experience in providing new and used powder coating systems to companies providing industrial finishing services. What differentiates SEI from equipment dealers and on-line trading companies is our ability to deliver cutting edge powder coating solutions that focus on quality finish, production efficiencies and financial suitability. The success of SEI is largely due to our experience in building powder coating systems for a broad range of clients. SEI has an extensive network of industry experts who play a major role in the design, installation and service of these systems. Whether you are looking to build a Turnkey System for large production runs or building a Batch System to finish varying size parts, SEI has the knowledge and experience of powder coating systems that guarantees that you will get the right equipment at the right price! Call us at: 888-310-2680 to review your powder coating needs or complete our on-line survey so we can help you find the best powder coating solution to meet your finishing requirements. Jan 4, 2019 – Section 179 is one million dollars for 2019, as stated in H.R.1, aka, The Tax Cuts and Jobs Act. The deduction limit for Section 179 is $1,000,000 for 2019 and beyond, while the limit on equipment purchases remains at $2.5 million. Further, the bonus depreciation is 100% and has been made retroactive to 9/27/2017. It is good through 2022. The bonus depreciation also now includes used equipment.